In late June, our design of the new building of the Netherlands Aerospace Centre (NLR) in Marknesse was officially opened. 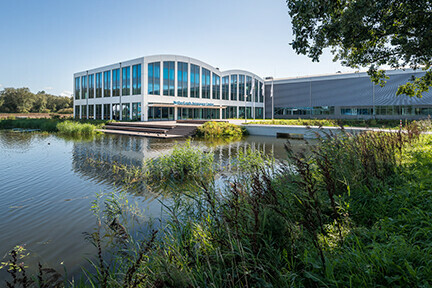 The facilities that had grown organically in the Noordoostpolder were due for renovation. With the new building, a significant step forward was taken in both spatial and organisational sense. To prevent the prominent knowledge from splintering, all facilities were housed under one roof, in a modern and future-proof research centre. Everything from stress testing parts to microscopic materials research and from wind tunnel tests to creating composite prototypes. All specialisms are now housed under one roof, with a single ambition: increasing the knowledge exchange and collaborations within the organisation. The new building is flexible in both spatial and functional sense thanks to the building’s generic design. This makes shrinkage, growth and development of test facilities possible. The office environment meets NLR staff’s needs regarding meetings, teamwork and secured and focused research. A 180-metre-long ‘central street’ separates the test facilities from the office spaces. The various security layers throughout the complex prevent visitors and employees from accessing information they are not supposed to. A lot of attention was paid to NLR’s sustainability ambition. The energy requirements of the centre’s research facilities are complex and large. Test facilities may not influence each other, so a sustainable energy carrier was necessary, one that offers specific solutions for special situations. Solutions such as peak loads from the wind tunnels being absorbed through pond cooling and the basic climate of the complex being achieved via soil storage. The building was designed to be low-maintenance. Sun protection was implemented as an architectural component of the large façade openings: using a combination of reflective coating and custom-made screen printing, external sun protection was made redundant. As NLR is a forerunner in the development of composite production techniques, Inbo aimed to reflect this aspect in the materials used in the outer walls. Large, seamless composite façade elements ensure a calm and simple image. A unique object in a vast polder.